Friendship Centres have been operating since the early 1950-60's. MAC was formed in 1971. 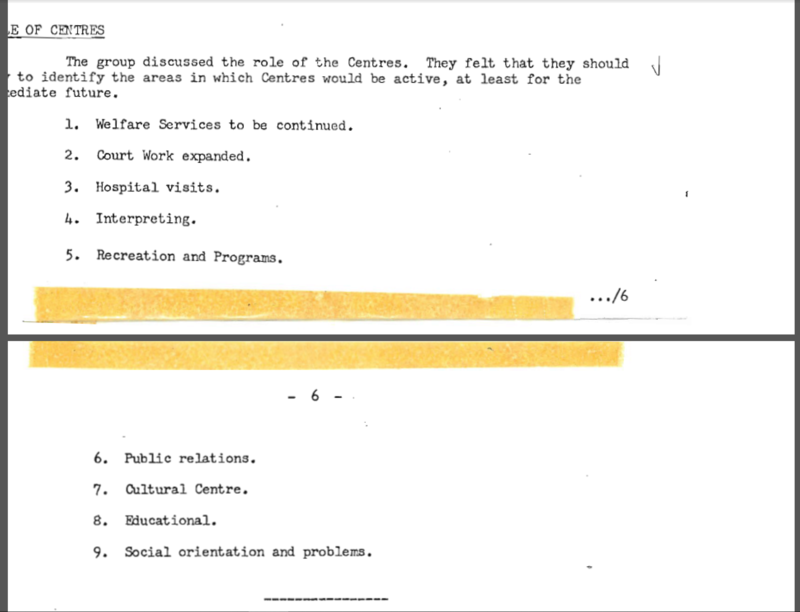 The need to form an Association of Friendship Centres began in the early part of 1970. 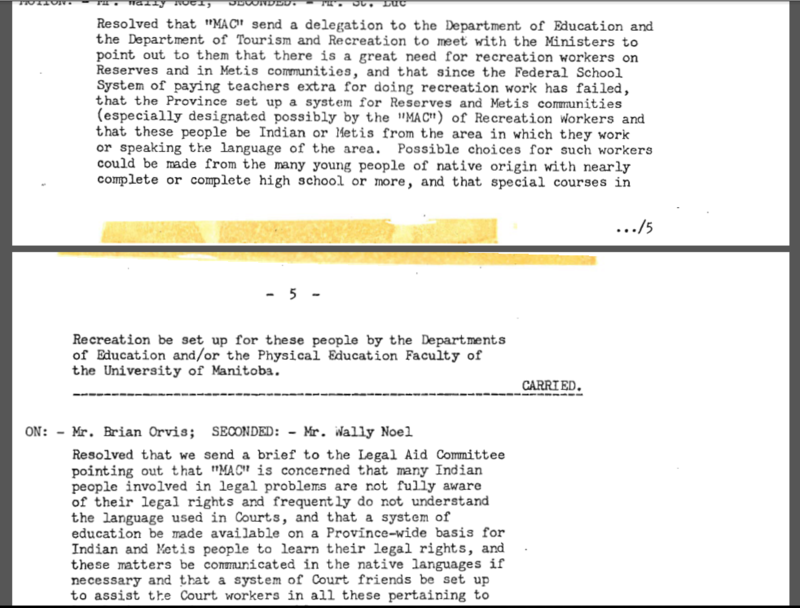 This need formulated into a meeting on October 24, 1970, held at the Westminister Hotel in Winnipeg with representation from the 7 existing Friendship Centres. A number of motions were made, the most pertinent being – 1st – to form a federation of Friendship Centres and that it be called the “Manitoba Association of Indian & Metis Friendship Centres” , 2nd – the short form would be known as “MAC”, 3rd – that we have 2 Committees – a Northern Committee and a Southern Committee, and that they would be responsible for preparing, a) material for each meeting, b) a draft constitution, and c) work on formal matter pertinent to the founding of MAC; 4th – that George Munroe be President, Jack Reed, Vice President, and Brian Orvis, Secretary/Treasurer. In these early planning stages only one delegate per Friendship Centre was financed by the infant Association, although generally 2 delegates represented each Friendship Centre. The Southern and Northern Committees continued to meet. The firm of Walsh, Micay & Co. of Winnipeg was engaged to incorporate the Association. The Association was incorporated on September 7th, 1971 and its formal name became “The Manitoba Association of Friendship Centres Inc.” At the time of incorporation, there were 7 existing Friendship Centres – Selkirk, Winnipeg, Portage, Brandon, Swan River, The Pas, and Flin Flon. Since then 4 Friendship Centres have been added. Dauphin in June of 1974, Lynn Lake in March of 1976, Thompson in 1978, and Riverton in 1981. On September 17, 1971, the First Annual Conference of MAC was held in Brandon, Manitoba. The second Executive Committee was elected: Don McKay became the second President of MAC; Melba Bouvier became Vice President, and Brian Orvis became Secretary/Treasurer. On June 26th, 1972 the second annual conference was held in Swan River. The third Executive was elected; Stan Guiboche as President, Melba Bouvier, Vice President, and Ida Guiboche, Secretary/Treasurer. Plans went underway for a Constitution and Bylaws for MAC, and the all important issue of future funding. On December 7, 1972, MAC met with the Premier and his Cabinet for continuing and more adequate funding for the association. The meeting proved successful. About the same time, the firm of Bancroft, Whidden, & Mayer of The Pas was engaged in regards to the Bylaws. The Association continued to expand and the workload became heavier so it was decide to hire an Executive Secretary. An Executive Secretary was hired in January of 1973 and the Association has continued to employ one staff person full time. At the MAC board meeting held at The Pas in March of 1979; it was then decided to change the title of Executive Secretary to Provincial Coordinator. On June 23rd, 1973, the third annual conference was held in Selkirk, Manitoba where the fourth Executive was elected and the Constitution and Bylaws were accepted and ratified. Through the years and until present time, MAC meetings have been held every 3 months along with the Annual General Meeting. MAC is affiliated with the National Association of Friendship Centres and also enjoys a congenial and cooperative relationship with the other 2 major Native Organizations in Manitoba, the Manitoba Indian Brotherhood and the Manitoba Metis Federation.